New to the site here and vintage seiko, so I apologize in advance if this isn't the place for this. oddly hand 'engraved' with the intials "G.O.H. 1968"
The reference on the dial and caseback should match right? Im assuming one was replaced at some point? But the SN date and the engraving are really throwing me for a loop. Any other clues I can look for to try and pin this piece down a bit more? I'll try and get some photos posted as well. Last edited by Robskii; 06-26-2018 at 10:37 AM. You can use the advanced editor (click on "go advanced") and add attachments to your post via the paper clip button. Resist 6105-8000 are rare. Mixed resist/waterproof is unusual, but I remember hearing something like that being "original". The engraving could have been added later, but it IS strange to find on a 1970 (PROOF) caseback. Went ahead and uploaded some shots as well. 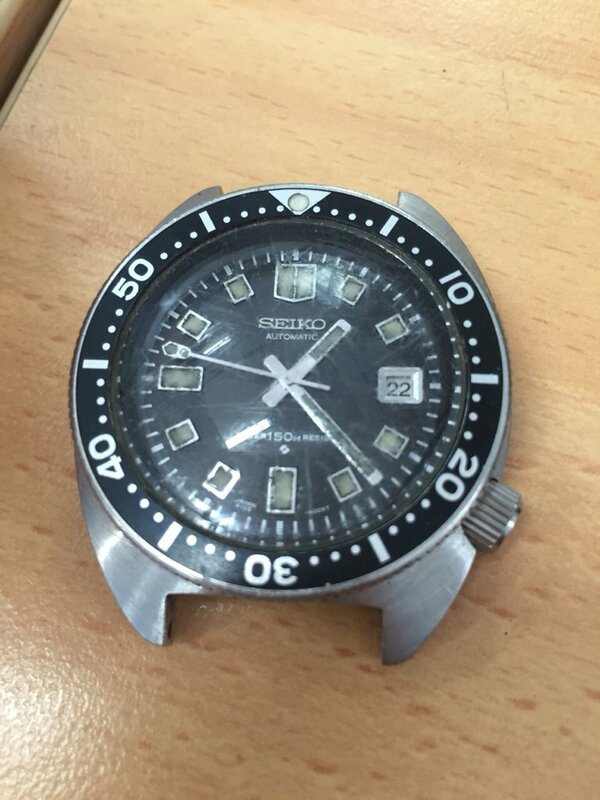 I havent been able to remove the caseback quite yet. It's on there pretty damn good. Nice transitional 6105 I'd say. 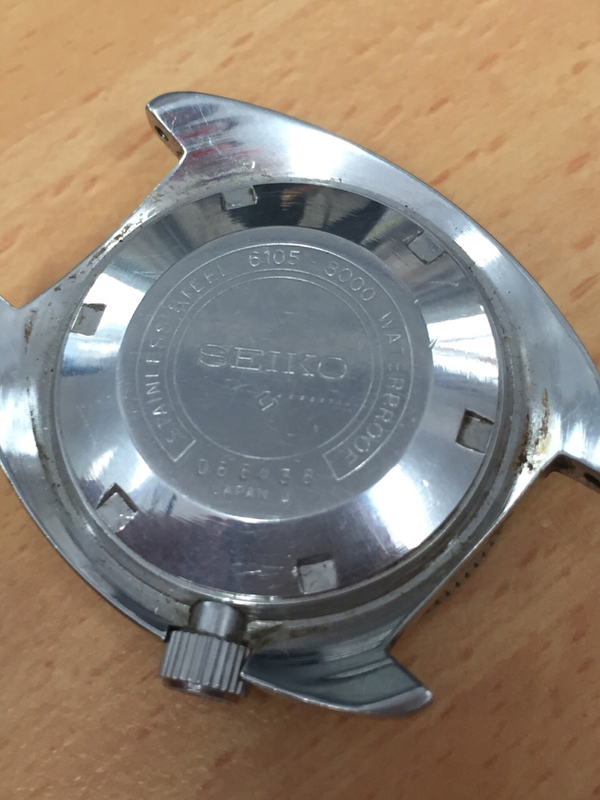 Only real way to check the dial isn't from a donor is to see the date stamp on the back if indeed it's there. But if you ask me that's original to itself. New crystal maybe and it'll look even better. Slight blackening to the lume but doesn't look too bad. Don't damage the caseback if it's on tight..the engraving doesn't look too bad either. Might even be able to remove it with a light brushing but I wouldnt let it bother me. Also the seconds hand is longer than later models which again would indicate it's unlikely to be a resist dial and movement transplant. I assume you can't hack the second hand? Plans for this are just a service, crystal replacement and correctly sized strap. I wont mess with the engraving. Personally I kind of like the character it adds! Interesting it hacks. Nobody knows for certain I guess....But if you want to let us know what whoever services it finds on the rear of the dial, that would be interesting. Ideally a date stamp within a few months of that...04/05/06 or something. Thanks for the kind welcome and quality insight! Looks really good but would change that 18mm NATO for sure! Welcome and best of luck with what looks like a nice watch. Great find. Completely legit combination of parts on this one. My June '70 6105 8000 has an 8009T dial, proof caseback and resist dial, and it hacks (6105B inside). Wow!! This looks about perfect! Reassuring to see another in the same exact configuration. Thanks everyone! 2. The British Soldier and the American G.I..
Something not mentioned in this thread, but multiple times throughout the forums, is the crown gasket and the importance of getting it redone. Depending on who you send it to, they may or may not know how to do it (the first shop I sent my 6105-8119 to didn't, so I had to have another specifically reseal the crown). Make sure it's included in whatever work you have quoted. Great find for only 2 figures. Wow. 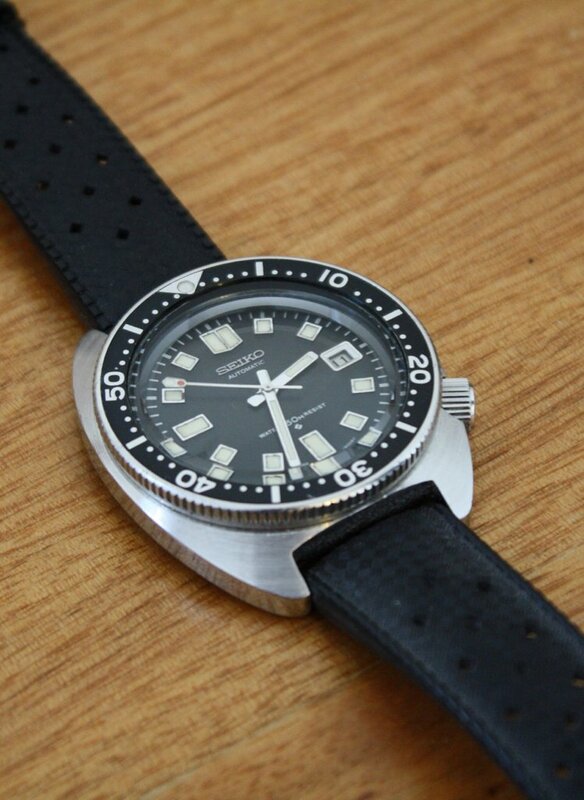 Also, it may be difficult to source a NOS Seiko crystal, even harder to find a Type 1 (the different heights aren't denoted by Seiko so someone selling the 320W10GN00 might not know which style it is...), so checking Klein Vintage Watches will be your best bet to find the best replicated acrylic, in my opinion. I have his Type 2 on my 6105-8000 and Type 3 on my 6105-8119. You can google him. He also does, arguably, some of the best restorations on these watches, but he isn't cheap and isn't fast... (Definitely go acrylic for the crystal and not sapphire). There's a LOT of knowledge on this forum, especially with these watches; least of all from me, I'm still a relative noob. Do a quick search for 6105 here and start reading. They are great watches with lots of history and many different "quirks" in how they were put together. Have fun with it. Oh, and I agree to get it off that 16mm(?) NATO and find a good waffle strap or tropic strap. Uncle Seiko is the preferred vendor around the forum, and for good reason. Last edited by ashbaug2; 06-27-2018 at 02:38 PM. Thanks for all the direction everyone. Unfortunately I hastily jumped on one of the thai replacement crystals and ditched its god awful speidel band on the way home with it. I'll reach out to Klein Vintage since their site says they are currently out of Type 1 crystals. Im not a huge fan of the waffle/tropical straps but I think i'll be ordering one to have on hand anyways. Also that info on the gaskets is much appreciated. I'll be grabbing some of those soon. Much more research to do! Definitely take your time. You can source the gaskets yourself, or whoever you send it to should have them on hand, so long as they are familiar with the 6105 series. Spencer Klein (Klein Vintage Watches) and Jack Alexion (IWW/International Watch Works) are the two names thrown around as the "experts" on these services and restoration. As mentioned above, they both have serious backlogs and are quite spendy, but they will do it right. If it's just a simple movement service and aren't going to re-do any dial or hand lume, a good watch maker can handle it, I'm sure. Problem is, it's often difficult to find a good watchmaker... Hence, why so many people recommend the pros here on the forum. I kind of jumped into getting my 6105-8119 fixed up and wish I had sent it to one of those two guys. It was my dad's that I got when he passed away last year. The guy I sent it to did a good job, but when he relumed the dial it isn't quite perfect, like I had wanted... I wanted it back so fast so I could wear it, I didn't take the forum's advice. That one piece still bugs me, especially since I've only worn it a handful of times, so having it gone for 10-12 months wouldn't have mattered... I'd have gotten it back by now and it would be perfect. Anyways, good luck with it all. Make sure you update the group once you've got it back from its "spa treatment"! wow, they really do looks stunning. Have been looking for one myself for a little while. What a great barn find—I need to find a barn like that!